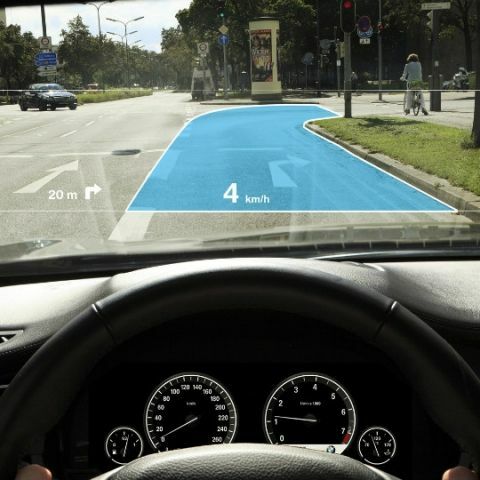 Continental, an automotive parts supplier company, showed a demo of an augmented reality heads-up display, which displayed information on navigation and safety for future car windshields. At Nvidia’s GTC developer conference, Continental demonstrated the next generation of heads-up display that “paints” information on the road. The demo reminds us of Iron Man’s visor, on which Jarvis shows important, relevant information. In current HUDs, information like turn-by-turn direction and signalling to ‘slow vehicle speed’ is projected on the lower portion of the windshield, helping drivers to be alert without looking away from the road. But, this information is mostly a flat, monochrome projection. Applying augmented reality entails merging of computer-generated graphics with real-world view. In cars, it should fit on to the windshield so that it looks like a part of the environment. Continental is accomplishing this by implementing next generation windshield protection technology with a frame rate of 60 fps and high-definition GPS. This augmented reality HUD can be used for lane departure warning, adaptive cruise control and turn guidance navigation. This would mean that a line of yellow arrows would appear ‘painted’ on the road (actually being projected realistically on the windshield), and the driver has to follow the arrows to navigate instead of looking into the small GPS screen. This should technically make life much easier and help us take the correct left instead of missing it. One big challenge here is that the car has to be placed accurately on the map, to show the correct direction. And this is precisely the reason why Continental is using High-Definition GPS to develop the system. HUDs were previously a niche component in automobiles. For instance, BMW offers impressive colour graphics information display about navigation and safety. Christian Reinhard, who leads the development of human-machine interaction for Continental’s subsidiary Elektrobit, explained that less-expensive enabling of technology allows for HUDs to be set-up in lower-end cars as well. Initially, Continental’s innovation will appear in high-end luxury cars, and will trickle down across different categories.